Wealthy consumers are more loyal. A nationwide survey by Parago (www.parago.com) showed that high-income households exhibit greater loyalty and are influenced more by loyalty programs than average income households. Even more influential than age, gender or geography, household income proved to be most indicative of the strength and impact of customer loyalty. In total, 94% of high-income households said their membership in a loyalty, rewards or frequent customer program had a strong to moderate influence on their purchasing decisions, versus 78% of all consumers. As income increases, so does the importance and impact of loyalty programs on consumers. Among loyalty program members, 92% of high-income households ($125K+) are actively enrolled in an airline frequent flier program, compared to 51% of all respondents. Hotel program membership showed similar income-dependent results, with 78% of high-income households enrolled in a hotel reward program, compared to only 35% of the general population. High-income households also differ in the types of rewards they prefer to receive from loyalty programs. Compared to the general population, high-income households are less interested in price discounts and more interested in receiving both rewards and recognition for their loyalty. In the Parago study, 39% of high-income households named the “special treatment” they received from loyalty programs as one of their favorite things. Particularly among male travelers first-class upgrades, perks, faster check-in and boarding were more important to them than the free miles. The loyalty programs affected consumer behavior. According to the survey, 93% of US consumers were willing to depart one hour earlier than needed for a flight—if it meant they could fly on their preferred frequent flier airline. Sixty seven percent of frequent flyers said they would be willing to pay $25 more (or 5% more) for a ticket on their frequent flier airline versus a competitor. The loyalty program for a retailer, bank, or other service provider begins with a customer application or registration form. The idea is to capture not just the name and address, but some information about the customer which is relevant to her purchasing decisions concerning your products or services. Be sure to get her email address with permission to contact her through email. You will also want to get age, income, home ownership, and length of residence. If you find, by testing, that these questions reduce your registration rates, you can actually get all of this information (and a lot more) appended from such nationally compiled databases as AmeriLINK® maintained by KnowledgeBase Marketing. To get the customers to register, there has to be something in it for them. If they ask, “Why should I register?” your answer could be, “Because we want to reward our regular customers more.” What are the rewards? You must determine that. They could be lower prices for card holders, access to information not available to others, or points towards achievable rewards. The rewards must be so compelling that most customers will want to register. 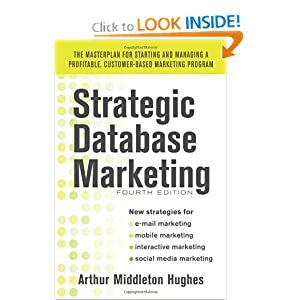 Once customers are registered, you will want to put all of this information into a customer marketing database. There is no question today that loyalty can be created or increased by awarding points or miles. The basic idea behind points is to avoid discounting your product. Points represent a gift or reward which cannot easily be related to the price of the product or service. Millions of Americans’ loyalty to an airline is molded by frequent flyer programs. These airline points programs work. Do loyalty programs work for other products and services? The answer seems to be, yes, but not as well. There are scores of other programs run by restaurants, retail stores, banks, hotels, credit cards, long distance services and others who reward customers with points. Many companies have been able to prove, using control groups, that these programs do build loyalty. Depending on your situation, you may not require customers to use their loyalty cards whenever they make a purchase. As a result of their registration for the card, you have their telephone number. You should have at least one credit card (Master, Visa, Amex or your own proprietary card) registered with you with the card numbers in the database. Every night (or more often) when your POS systems are polled to provide data for your database, you can run all the credit cards used and telephone numbers provided against lookup tables in your database, so you can record transactions in your customer’s files even though they have not used their membership card or provided their card number when they made a purchase. Of course, with a good POS system connected with your database, just the entering of the phone number at the POS station will bring up a customer transaction history on a screen at the station, so that the clerk can talk to the customer as if he knew her. Loyalty programs are based on the data accumulated on each customer. Brian Woolf said on this subject: “The primary purpose of a business is to acquire, satisfy, and retain customers, profitably. The primary purpose of a loyalty program is information, which then helps achieve the goals of the business. Customer information is used to help a business retain its customers (i.e. build loyalty). But it is also used to help accomplish the other business goals of customer acquisition; satisfying customers with the right location, product assortment, quality, service and friendliness; and doing so cost-effectively, by helping identify inefficient and wasteful areas of spending, particularly expenditure on low yield customers”. Once customers are registered for a loyalty program and on your database, you can create periodic reports that will enable you to direct your loyalty program in profitable directions. Establish a system to detect problems and resolve them before the customer headed for the door. The program generated a return on investment of $2.09 for every $1 invested. Churn (attrition) of those customers receiving the rewards communications was 1.27 points lower than those in a control group.